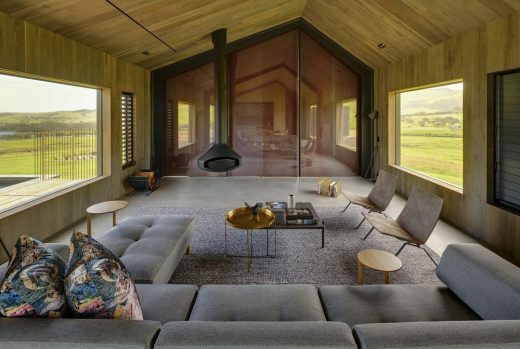 This modest two bed guest house explores the vernacular farm shed, with a plan that’s charmingly simple yet highly considered in its detail. 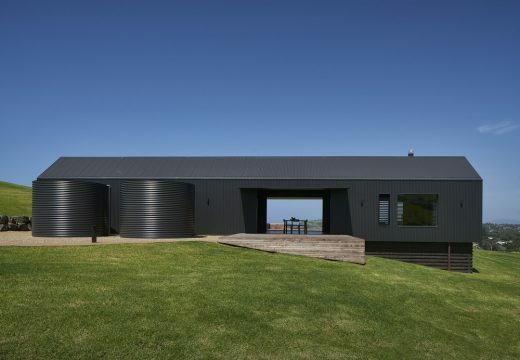 Located on a quintessentially NSW South Coast dairy farm. 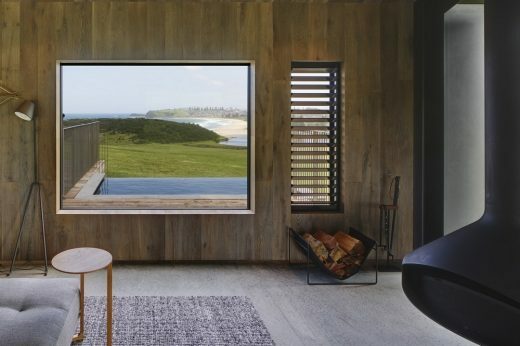 The design explores the vernacular steel portal frame typology in a highly refined and detailed way. 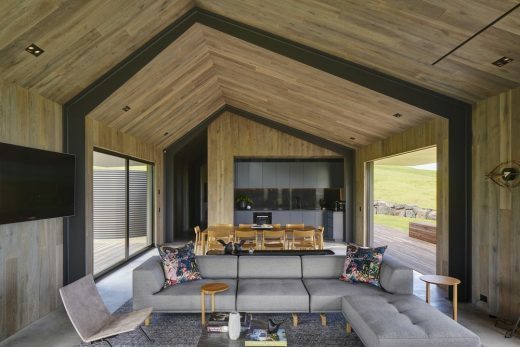 The response to the project, chiefly came from the clients brief to provide a modest two bed guest house that had a simple farm shed like appearance. 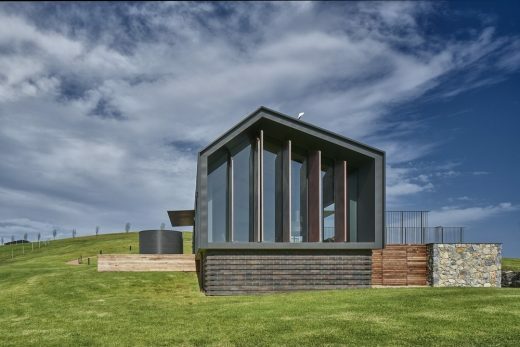 The design explores the vernacular steel portal frame building typology in a highly refined and detailed way. 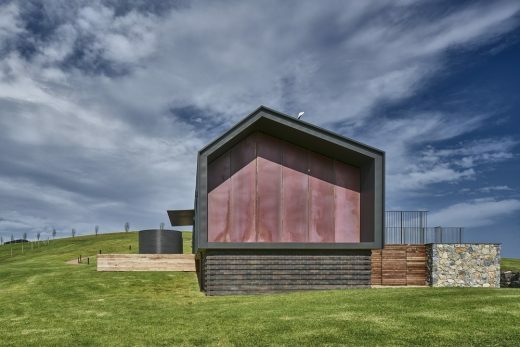 The local cultural significance of metal shed dairy structures (many of which in view of the project) and iconic green rolling pastures in a seaside setting, is honoured and further explored. 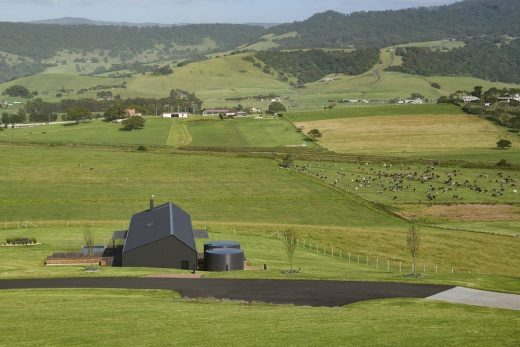 The parcel of land has been worked by the same family of dairy farmers for 150 + years, with several of the nearby shed structures visited during the design phases. 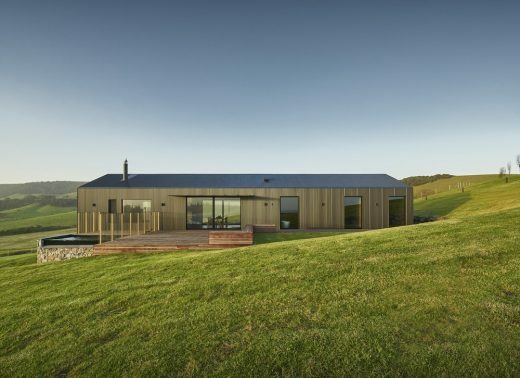 The site positioning offered a significant view towards the aforementioned dairy with the setting sun over the escarpment potentially offering a unique user experience. 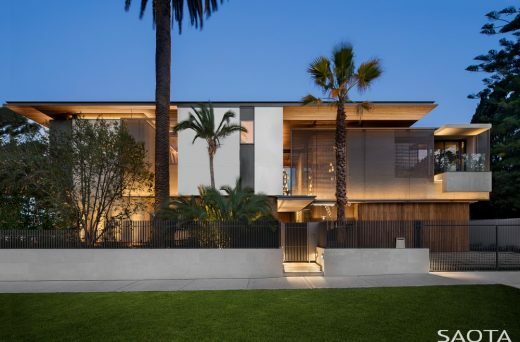 The major innovation in this project is the bespoke operable western facade. 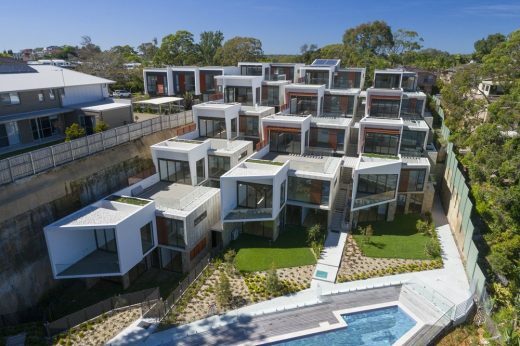 Hydraulic cylinders hidden in the sub floor operate six full height copper louvre panels providing control of solar heat gain, views and light. 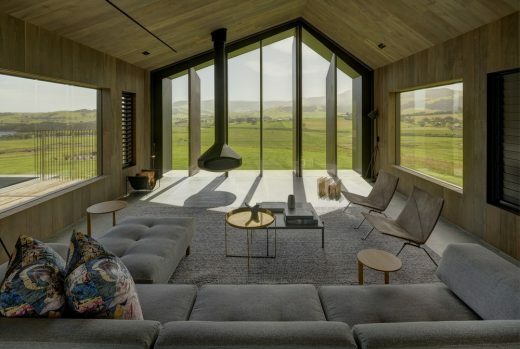 The system provides dramatic light effects in to the living areas or can be fully closed at the touch of a button. 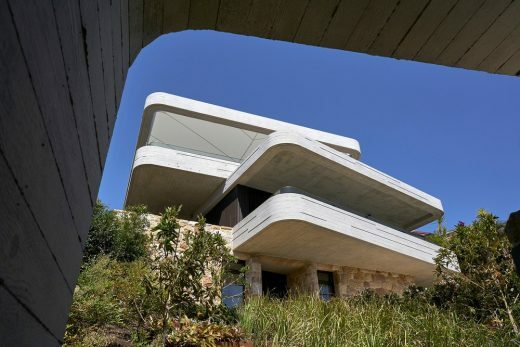 The concept was developed to open up the whole western facade to take advantage of this setting sun and escarpment views. With our concept design drawings in hand we engaged a local engineering company (Cram Fluid Power) to collaborate with for the fabrication of a bespoke system. 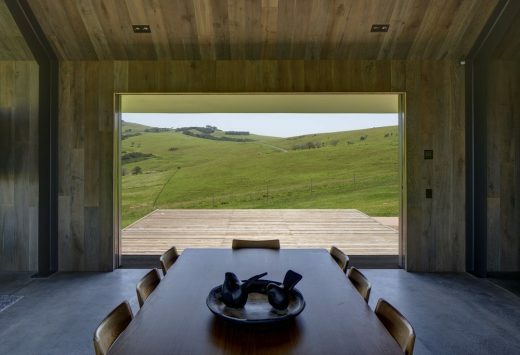 The simple rectilinear floor-plan aligned with the long edges facing North/South, set up a strong primary axis as these also make best use of the ocean views to the south side and pastoral views to the other. The other strong axis is that of the East/West which aligns with the inner circulation path and the other major view to the signature Illawarra escarpment in the west. 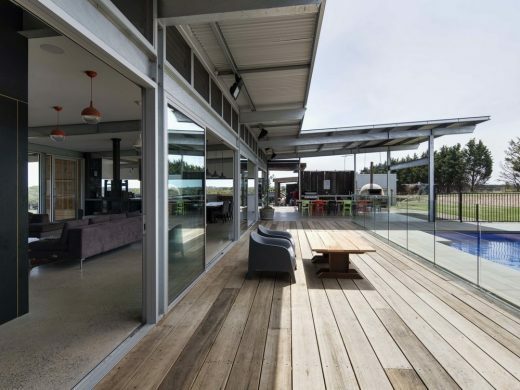 The point of intersection between these axis forms a runway of timber decks on either side of the building. 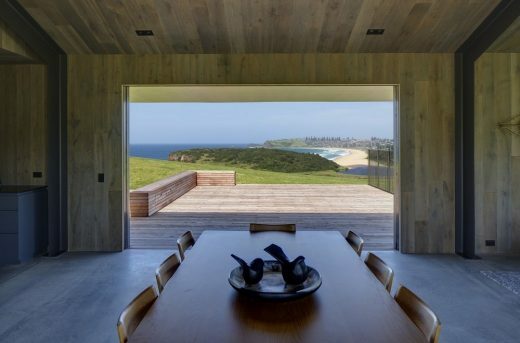 At the point of entry, a framed view through the building to the ocean on the south side is formed. 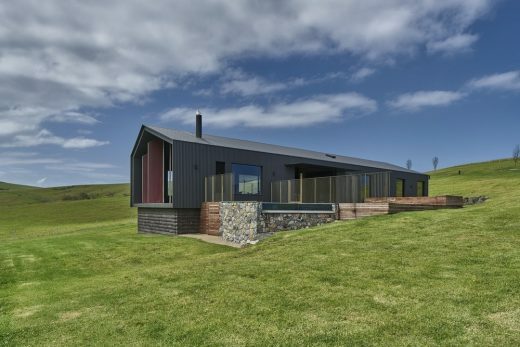 The project utilises the north and south decks as ‘winter’ and ‘summer’ decks to enable the occupants to use the building mass as sun or wind protection moving to each side as favoured. 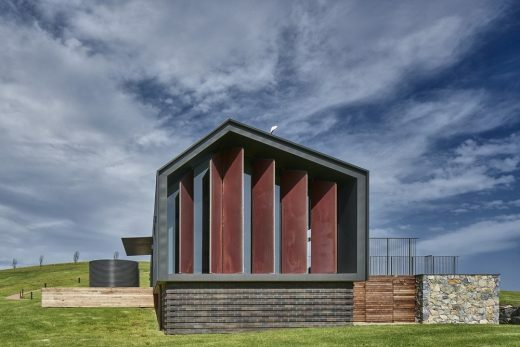 The project’s sustainability features include utilising only tank water (harvested from the roof), double glazing high levels of insulation and on-site sewage treatment. 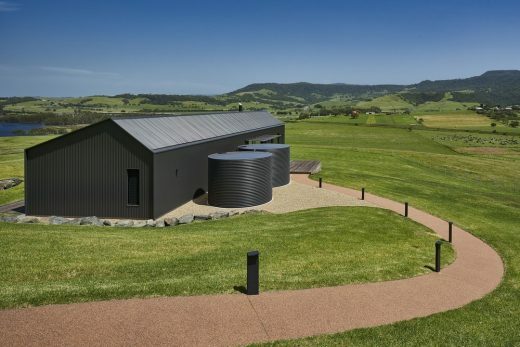 Other sustainability measures incorporated into the design are; passive solar, extra thick highly insulated walls, double glazing, on-site sewage treatment and supplementary solar power.